De-cluttering your home can seem like a huge task, but if you tackle it one step at a time, you can get organized and transform your home. To increase efficiency, make a plan with specific goals to jump start the process. Write out all of the spaces you want to want to clean and create a game plan and timeline for each one. Try to take it one area at a time to ensure you stay on track and are able to prioritize which areas to clean first. When you have decided on which area to tackle first, start by focusing on one shelf at a time. Empty it out completely. This will keep you from getting overwhelmed and create a system that helps you declutter efficiently without creating a bigger mess. You need a system that works best for you in order to sort through all of your items. Separate everything into boxes or bags to determine what should be tossed, donated, or kept – the three-box method. For larger projects, rent a dumpster to maximize cleaning. You’re more willing to throw out unwanted items when you have space in the trash and aren’t waiting around for trash day to empty your small bins. By conquering this task first, you will feel more motivated to keep cleaning other areas of your home. Cleaning can give you a sense of accomplishment when you are able to see how nice it looks and how transforming the space is positively impacting your daily life. Once you’re finished decluttering your home, you will need to keep it that way! Create positive habits like donating two items for every new item you purchase. It’s also important to schedule regular up-keep cleanings so you can maintain your newly organized living space. To keep up with your cleaning routine, an important part of decluttering is to limit the things you buy. Create a 30-day list and when you want to buy something you aren’t sure is necessary, write the item down on the list with the date you wanted to buy it. Make a rule to never buy anything (with the exception of necessities) unless it has been on the list for 30 days or longer. This will keep clutter from building up again, because often you will lose the urge to buy something unnecessary. Set organizational goals – To increase efficiency, make a plan with specific goals to jump start the process. Write out all of the spaces you want to want to clean and create a game plan and timeline for each one. Try to take it one area at a time to ensure you stay on track and are able to prioritize which areas to clean first. Pick a shelf – When you have decided on which area to tackle first, start by focusing on one shelf at a time and empty it out completely. This will keep you from getting overwhelmed and create a system that helps you declutter efficiently without creating a bigger mess. Toss, Donate, Keep – You need a system that works best for you in order to sort through all of your items. Separate everything into boxes or bags to determine what should be tossed, donated, or kept – three box method. For larger projects, rent a dumpster to maximize cleaning. 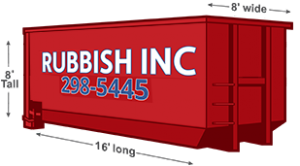 Rubbish INC Dumpster Rentals offers several different sizes that are perfect for any and all projects. You’re more willing to throw out unwanted items when you have space in the trash and aren’t waiting around for trash day to empty your small bins. Start with the space that bothers you the most- By conquering this task first, you will feel more motivated to keep cleaning other areas of your home. Cleaning can give you a sense of accomplishment when you are able to see how nice it looks and how transforming the space is positively impacting your daily life. Get in a clean-up routine- Once you’re finished decluttering your home, you will need to keep it that way! Create positive habits like donating two items for every new items you purchase. It’s also important to schedule regular up-keep cleanings so you can maintain your newly organized living space. Create a 30-day list – In keeping up with your cleaning routine, an important part of decluttering is to limit the things you buy. Create a 30-day list and when you want to buy something you aren’t sure is necessary, write this item down on the list with the date you wanted to buy it. Make a rule to never buy anything (with the exception of necessities) unless it has been on the list for 30 days or longer. This will reduce clutter from building up again, because often you will lose the urge to buy something unnecessary. 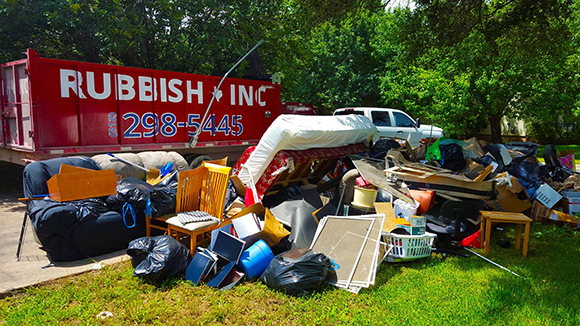 Rubbish INC Dumpster Rentals services all of Austin, Cedar Park, Round Rock, Georgetown and their surrounding areas. Call us now at 512-710-1903 to Book your dumpster rental or junk removal service.